I think they are a wonderful twist on the oxford trend that is happening right now. 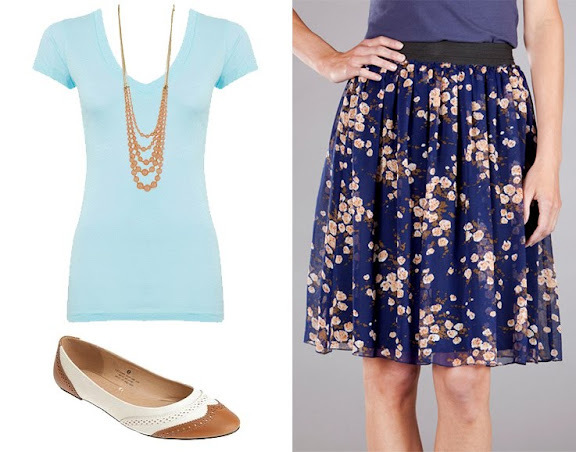 I love that they hint at the style, while still maintaining the femininity of a dainty flat. I liked the shoes so much, I decided to build an outfit around them. What do you think of these shoes, would you rock them? How about the outfit? Leave a comment! You both have great style so I bet that was fun! I love those shoes. Please tell me one of you got them? oh that's a beautiful outfit. I want it! Very cute shoes!!! 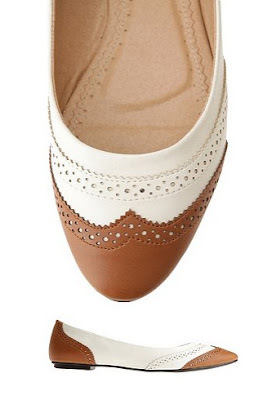 I don't like the wingtip look normally, but turning them into ballet flats is adorable and more feminine. Love the shoes! My husband just mentioned YESTERDAY that he thought it would be super cool for me to wear shoes like that! Maybe I can get these ones! As always, so cute! I'm a sucker for cute flats, so I'm in love with those, too! I would absolutely wear this outfit head to toe. Beautiful. Those oxford-inspired flats are so cute. I really like them! That outfit is way cute! I would totally wear it. those are remarkably cuter than the version you posted about previously. God, those flats are amazing. It'd be so easy to incorporate into my wardrobe. I love. Loving that outfit! Those shoes would look awesome with skirts. I'm going to hem my pants tonight and go rock the skinny jean this weekend! Woo hoo! Love those shoes! I was just browsing the Urban Outfitters website last night and was looking at some other shoes that are really similar! Wow. There are no words for how much I want those oxfords. Or that entire outfit for that matter. The shoes are adorable. I've always had a crush on the oxford. I love the shoes. I haven't really gotten into the wing tip fad, but I think I just might because of these shoes! And the outfit is just adorable, I would totally wear it! Darling shoes. I don't know that I could pull them off with that particular outfit though. Unfortunately UO's flats all have one major flaw.. their soles are so thin and so badly made that they can't possibly be comfortable.